I was born in Sunnyside Hospital, grew up in Outlook and Granger, and have currently lived with my family in Granger for the past four years. My roots run deep in this valley. My grandparents were some of the first to live on “The Hill” in Sunnyside. My dad delivered papers to many of those homes. The smell of mint and grape harvest brings me back to my childhood. I am also invested in this community. In Sunnyside, I get my groceries, buy my coffees, meet my husband for lunch, and drop my kids off at preschool. I enjoy supporting our local businesses like Mom’s Candy Apples, Melange and Cactus Juice Café. My desire for Sunnyside to thrive is driven by wanting my family to have a nice place to live. This past Saturday, I gave back to this community by volunteering for the Loving Sunnyside Initiative. I met with over 100 other volunteers at Sunnyside Christian Reformed Church, where we were treated to breakfast and coffee. Then we headed out into the chilly fall air, and I drove down a street I’ve never been down before to meet up with my crew. I was partnered with kids from Sunnyside High, Sunnyside Christian High, a couple that heard about the event on Facebook, my pastor, the head of Sunnyside United, and a few others. In a few minutes, we were loading our brushes with paint, climbing ladders, and helping a family paint their house and outbuildings. In just a few hours, the house was completely painted, and we were eating lunch. We talked about the blessing of being a blessing to others. The only thing I had to offer that Saturday was time. God can take our simple things and turn them into blessings. My time and the time of my crew mates was turned into an entire house and outbuildings being painted for a family. The house we painted now joins the 65 other houses in Sunnyside that have been painted thanks to the volunteers of the Loving Sunnyside Initiative! Each spring and fall, volunteers gather to paint houses. I encourage you to give back to this community. 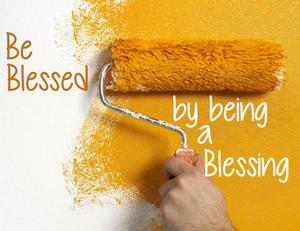 Be a blessing to others and be blessed in return!